Alex Gibney has never been one to shy away from tackling a controversial subject in his highly acclaimed documentaries. 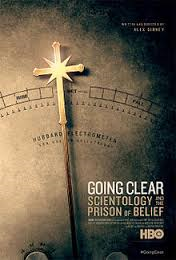 Going Clear: Scientology and The Prison of Belief is another superb piece of filmmaking from the Academy Award winning filmmaker that educates, entertains and completely shocks with it's in depth and explosive look at one of the world's most controversial religions. Based on the bestselling Scientology expose of the same name by Lawrence Wright, Going Clear is an astonishing look behind the religion that was founded by L. Ron Hubbard and has been making headlines for years for it's strong presence in Hollywood and unique beliefs. Many interviews with former members of Scientology paint a picture of what life was like inside the world that celebrities such as Tom Cruise and John Travolta vocally prescribe to and expose what goes on behind the scenes. Gibney's Going Clear is a shining example of brilliant documentary filmmaking as it gives one everything they need to make an informed decision about Scientology and provokes thought as well as a great deal of emotion. The knowledge that is transferred to the audience is edited in such a way that it builds and evolves the emotion throughout the film. The first third of the film walks through the origins of Scientology and the basics. Here one can understand how it seems so attractive to people to begin with and why people join, so the overall feeling is comfortable to the point that you can't understand what the negative fuss is about. Yet heading into the second part of the film and being informed more about the church's belief system, one starts to become disturbed by how strange their ideology is and that people can be so drawn in by this point that they believe anything. It is almost laughable the way the film describes it, until you head into the last third of the film. It is here that this disbelief turns into fear, as the information given is actually terrifying. It is brilliant filmmaking for a documentary to provide it's viewer with such a whirlwind of emotions and to end the film on such an explosive note. The film truthfully is completely bias as it is tilted dramatically towards exposing the dirty secrets behind the religion, but the film does say towards the end that several members of the Scientology church including current Chairman, David Miscavige and celebrity members, Tom Cruise and John Travolta all declined requests to be interviewed for the film. So it would seem that Gibney gave members of the church a chance to have their say and put forward a good word about their religion that would maybe even things out, but they declined . Was this because they knew of the book written by Lawrence Wright and had no doubt that the film was going to be an expose and therefore a negative look at their beliefs no matter what they say? Or do they really have something to hide? We can all speculate, but will never truly know as there is no first hand footage defending Scientology, and only footage from their elaborate celebrations and archival footage to support themselves. In its place, Gibney uses a wide range of resources and footage to tell all he can about the church, without the assistance of the church itself. 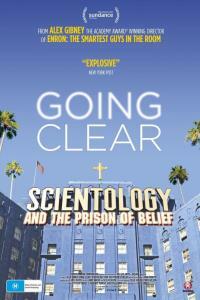 Going Clear: Scientology and The Prison of Belief is incredible filmmaking. It truly is an excellent expose with it's ability to make the viewer feel so much by imparting knowledge with superb timing and editing.